OK, so technically, mayonnaise is made with egg and oil, but for most vegans or those on the paleo diet, this recipe will be a welcome sight. 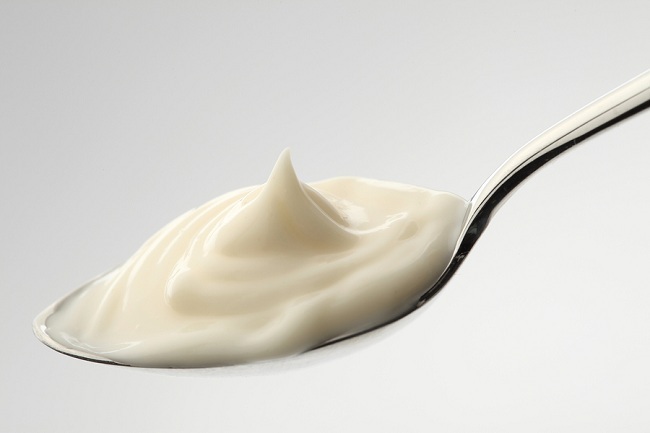 As you probably already know, most commercially made mayonnaise uses eggs and vegetable oil or soybean oil, things that many of us want to avoid. Nothing like a creamy mayo brimming with GMO soy or corn oil. Yum…not! Why bother when you can make it yourself at home? This recipe is loaded with healthy fats and can be used in any recipe you use regular mayo, such as tuna salad or egg salad. Are you ready? Here are two versions of an egg-free mayo that you are simply going to love. Put all ingredients in your food processor or blender and mix at medium speed for about 1 minute, or until thoroughly emulsified. Store in an air tight container (such as your old mayo jar) and keep in the fridge for a maximum of 3 days. Here is another MIY mayo recipe to try. You will need a high powered blender or food processor for this one. Soak the cashews for about 3 hours before blending.